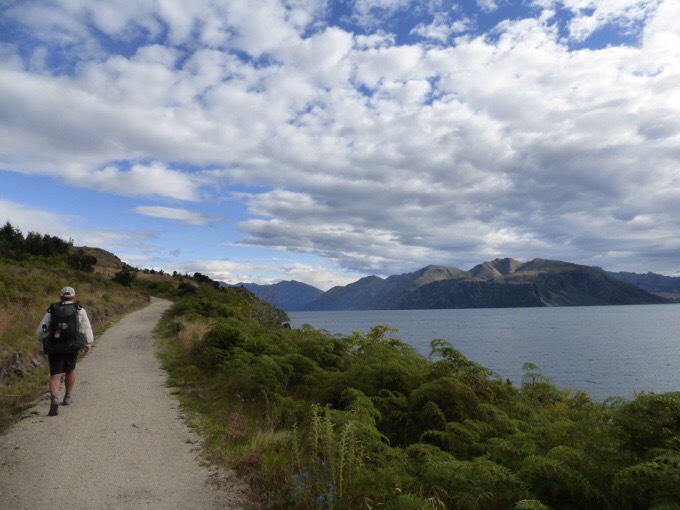 We got a leisurely start today knowing that the first half the day would be more cruising along Lake Wanaka. We had a good breakfast at a cafe on the way out and were hiking by 8:45am. 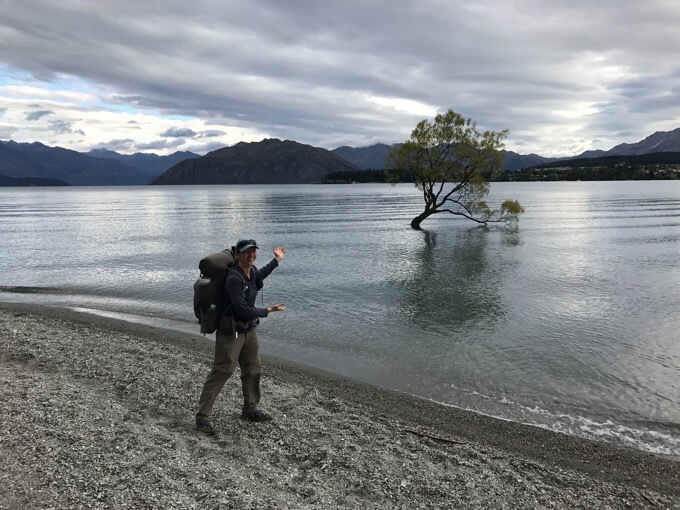 The excitement of the morning was seeing the often photographed tree in Lake Wanaka known as Wanaka’s Lonely Tree. If you Google it, you will find a ton of images of this tree in all seasons and lighting. I remember Becky showing me a photo of this tree months ago with no idea of where it was. 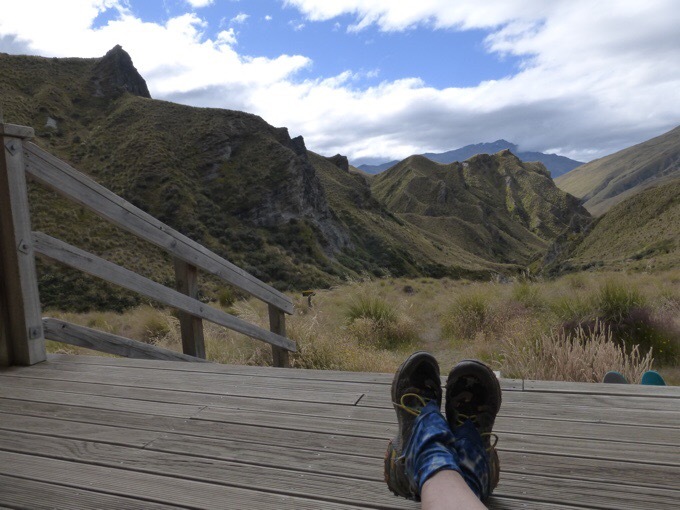 I totally forgot about it till yesterday when I saw another hiker had posted a photo online. I was glad I didn’t walk right by without knowing it. 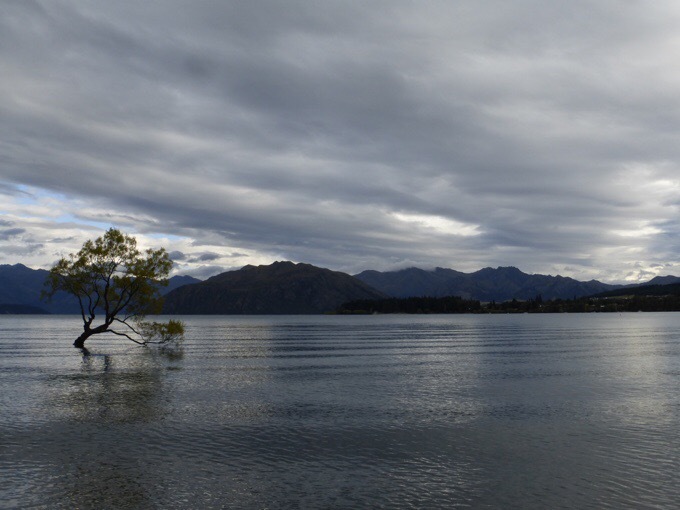 The Lone Tree of Lake Wanaka. I forgot to get a photo yesterday, but here’s Griggs with his new haircut, clean shaven, and wearing his new shorts looking spiffy. 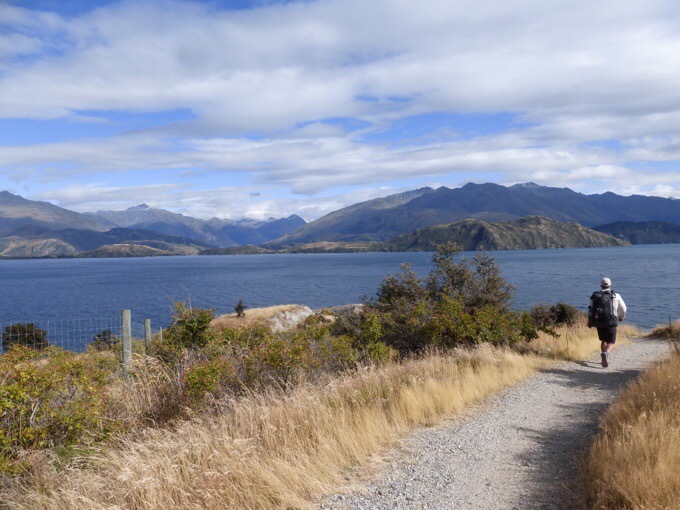 The first few hours of the day was a continuation of the gravel track around Lake Wanaka. Again, really relaxing, pleasant, and enjoyable. 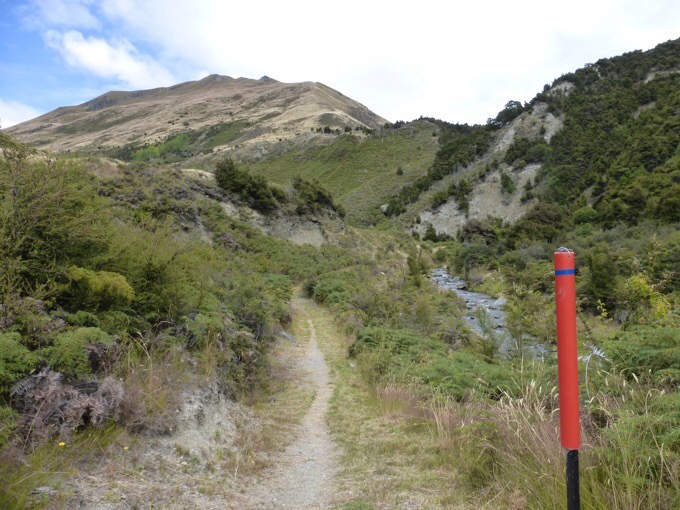 Once we passed a motor park, we turned onto the Motatapu Track, which is what we will be on for the next couple days. 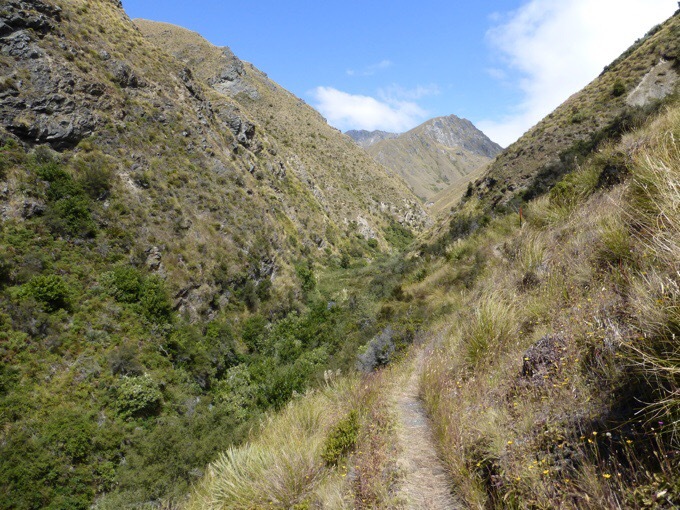 It is a mostly clear track that has a lot of steep ups and downs. The track notes are a bit intimidating because the 30mi/48km track is listed as taking 3-4 days to complete. That’s a long time! 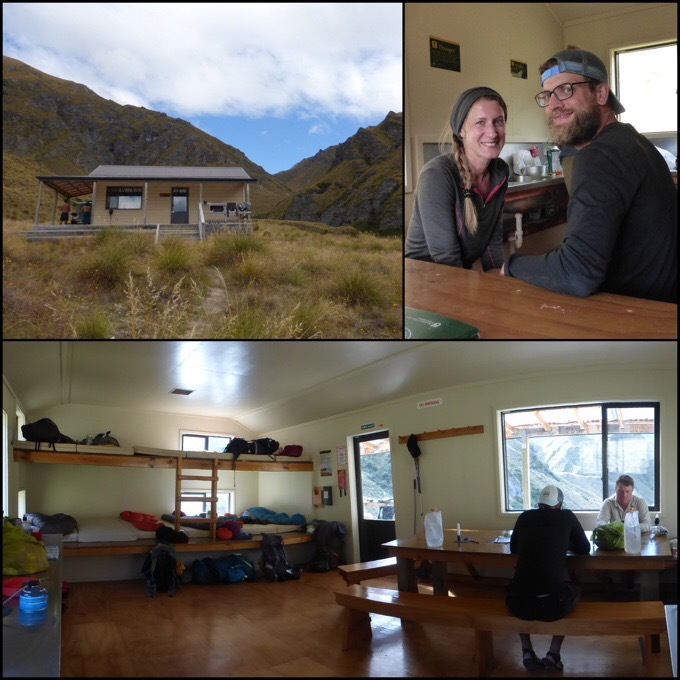 We are thinking we could do it in much less time, but gave ourselves plenty of time today to make it to the second hut, Highland Creek Hut. That will position us well for multiple options tomorrow depending on how slow the terrain ends up being. Let the Motatapu Track begin! 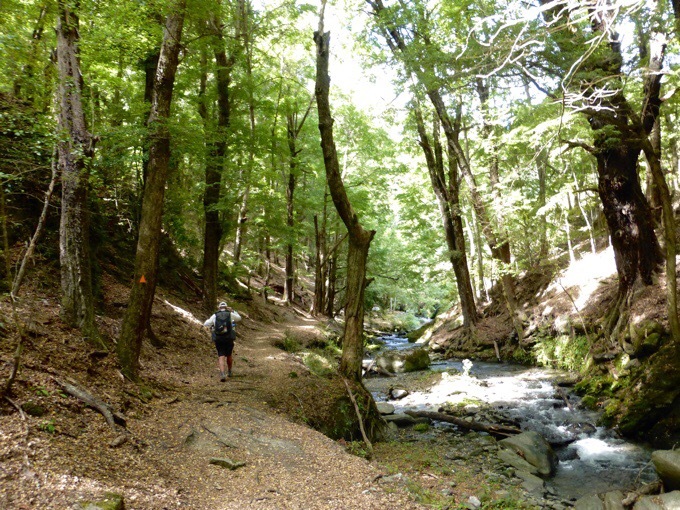 We had lunch before the climb started in a great wooded area along a pleasant stream. It was one of my favorite lunch spots all trail. While we were eating, Jan and Jasmine came by also on the way to Highland Creek Hut. 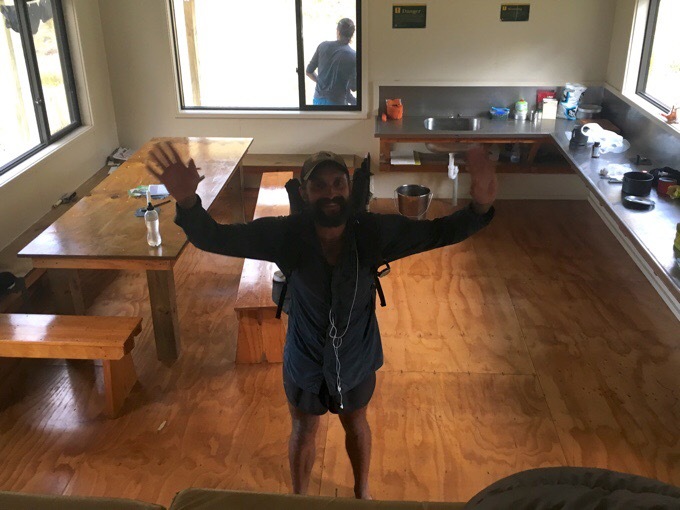 It’s always fun to see Jan and Jasmine as they were also on the same bus Felix and I were on to start the trail back in the beginning of November from Auckland to Kaitaia. We’ve leapfrogged ever since and it’s pretty cool to still see people I started with 99 days ago. Griggs started the same day as well. The last time we overlapped was in town at Arthur’s Pass 15 days ago. I didn’t get a photo today of them until the end of the day. The climb after lunch up to the first hut, Fern Burn Hut, went by quicker than we expected. There were steep ups and downs, but there was mostly good trail tread to keep a steady pace. Griggs flew through it and I met him at the hut where there were already many hikers stopped for the day. This section is an intimidating one, so many choose to do shorter days hut to hut rather than having to pull out bigger days. 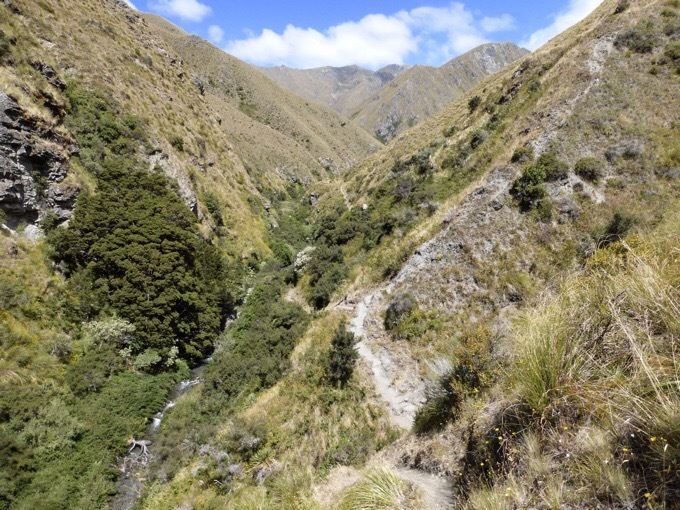 We took a break and moved on the next 4mi/6km to Highland Creek Hut. Jan and Jasmine had lunch there and also planned to move on to Highland Creek as well. 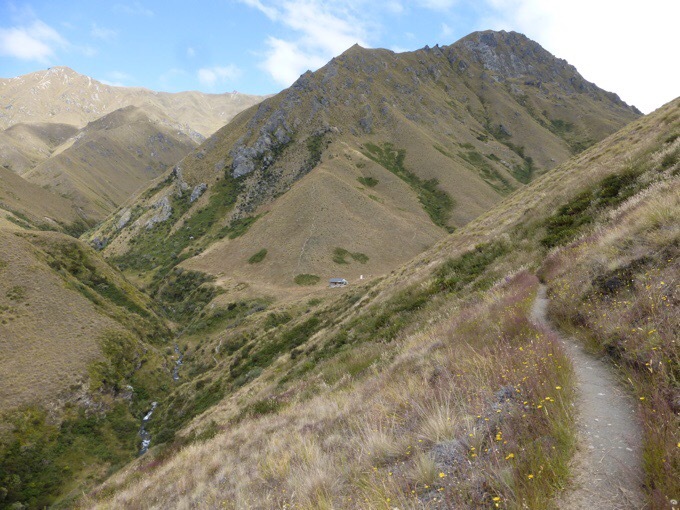 Fern Burn Hut in the distant saddle. 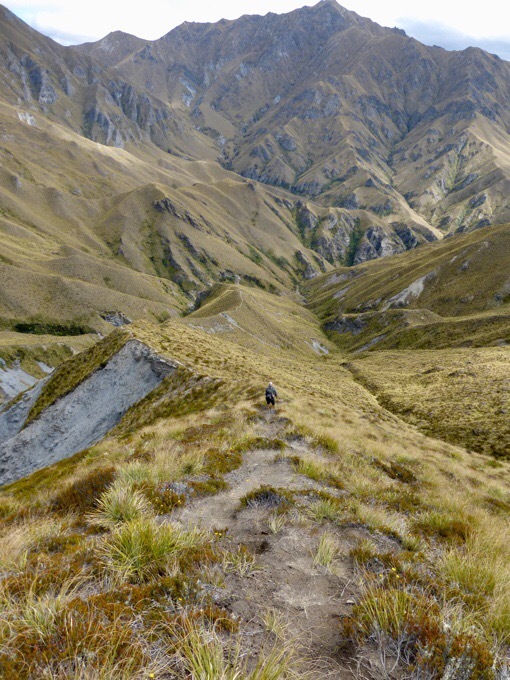 The track notes list the stretch of 4mi/6km of trail to Highland Creek Hut as taking four hours. We hoped it would only take three, and were really excited when we were able to do it in 1hr 50mins. 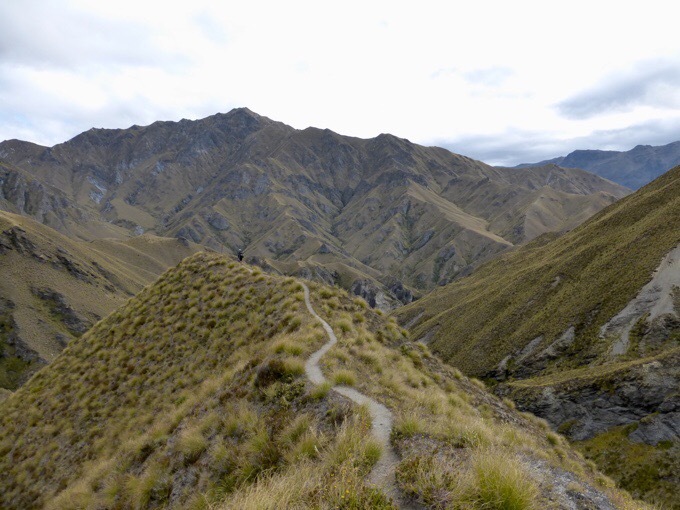 There was some consistent steep uphill to Jack Hall’s Saddle and the views were great. Again, we are really fortunate to have pretty perfect weather for this section. That’s a huge factor. After Jack Hall’s Saddle, there was a lot of steep down like a rollercoaster and we flew down that. Today was like a playground for Griggs. He loves skiing and felt like he was on a ski run going down. He was flying! I have to say that Griggs is the most compatible hiking partner I’ve ever had. He has even more endurance and speed than I do, and I can’t say I’ve ever seen him tired. That’s rare for me to find, and I feed off that type of energy. However, I am feeling like my body is getting old because of the role reversal that I’m not the energized one running up and down the mountains waiting for him. With Griggs, I’m the one in the back that he’s waiting on at the tops of the mountains. He’s like an engine I swear. 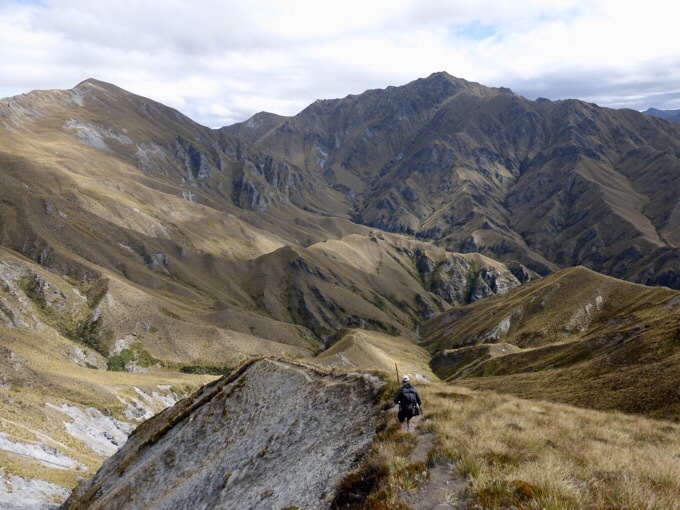 We did have fun on the track and took a ton of photos of the ridge walks and steep ups and downs. Griggs even did a cool time lapse video of me coming down part of the trail. I’m hoping it loads here. If you can’t get it to play, I posted it on Instagram and Facebook as well. 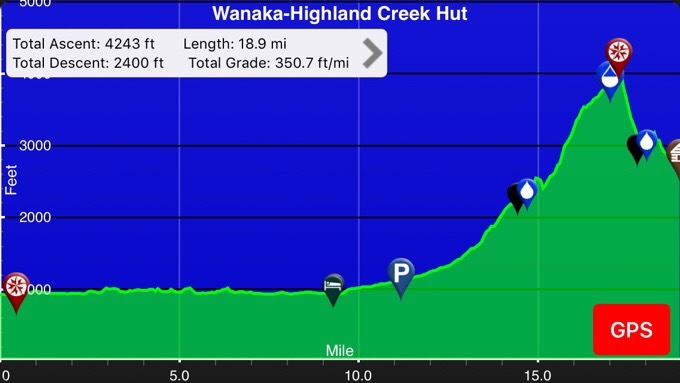 We got to the Highland Creek Hut earlier than expected at 5pm. I was super happy about that and loved having the early night to relax and rest up for a bigger day tomorrow on more of the same. The hut was in a great setting with awesome scenery of mountains all around. The hut sleeps 12 people, but can fit tons more if needed. It’s one of my favorite ones along the TA. Jan and Jasmin also arrived to make 9 people total in the hut. One northbounder and the rest doing sections. We had hoped Felix would show, but knew he left town a bit later and it seemed he wasn’t coming as it got later. Then, as everyone was starting to lay down for the night at 8pm, Felix arrived, yay! He was full of energy and the classic Felix you can’t help but adore. I’m now sleeping between him and Griggs and I can feel the kinetic energy just reverberating off Felix like he just had too many energy drinks. He doesn’t even need to do anything. Cracks me up. The plan for Griggs and me tomorrow is to get a good start and just see how far we can get. The options are to either do a strenuous possibly shorter day or a really strenuous longer one. Jan, Jasmine, and Felix are leaning towards taking a half day or day longer than us on this leg to get to town a day later, so we may not see them again this leg. We’ll see how tomorrow goes. Good news is that weather looks to be great again! 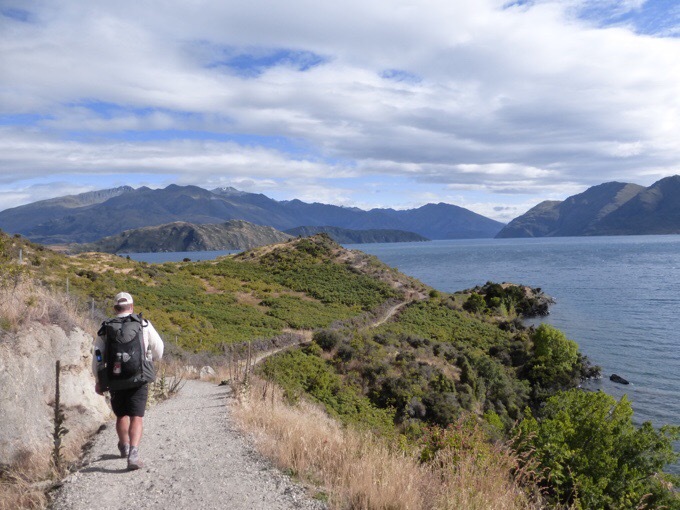 There is an unlocked ‘hut’ by lake wanaka..2 or 3km before Glendhu bay motor park.it is about 10km from wanaka city right on TA trail. It can make a great spot for anyone looking to save a few $ or looking for a roof..there is a table, few chairs and mattresses that can accomodate at least 4pax. This looks like my kind of territory. LOVE! Ha ha, had to laugh at you feeling old, Erin! You have a long way to go yet. Fortunately it turns out that the mountains are not a gymnasium, you can have fun out there even when you are decrepit like me .. isn’t one of your hiker friends in her 60s? Is that your feet in the photo above? Remember to get those shoes off at every opportunity..
Haha, I took that photo right when we arrived and I sat down and was too worn out to move! The Time Lapse worked on my Kindle Fire ? .. fun.. I am not on FB or Instagram, so thisvwas really nice. 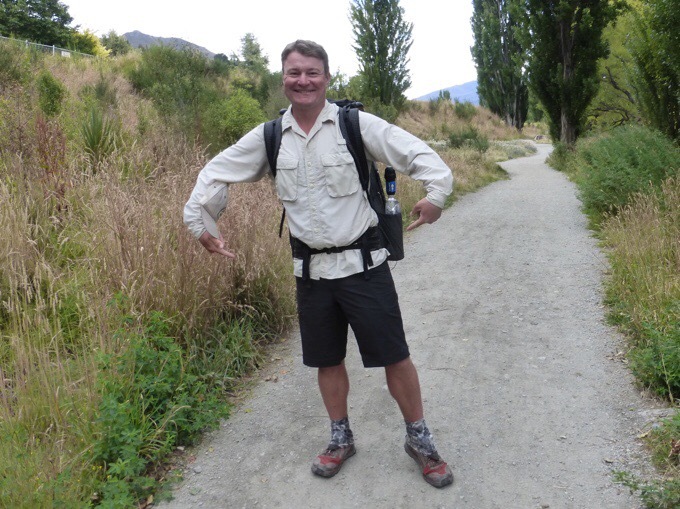 Griggs was looking happy in his nes shorts, but all his pictures radiate positive energy. Nice to see Felix, too. I still remember thise backpacking goats you encountered in N hemisphere summer. This is Don and Teri Ernst. 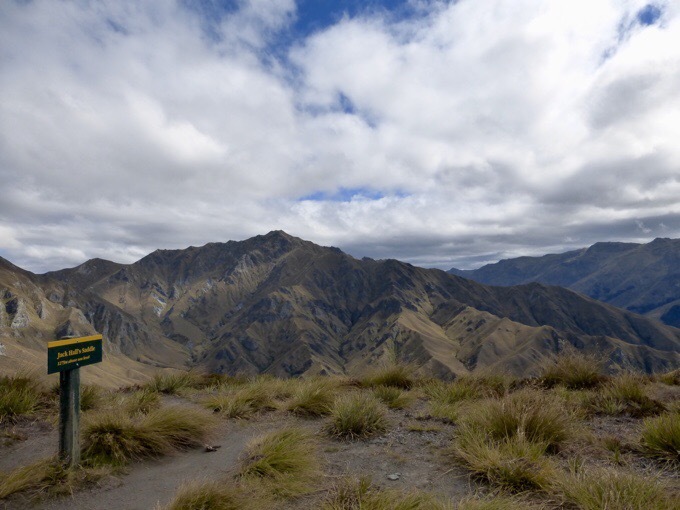 We spoke with you in Arrowtown and are the ones that kept asking gear related questions. Loved meeting you and hearing your story. Went into the house and immediately ckecked your blog. Found wonderful writing and great photographs! We live in San Luis Obispo, CA. 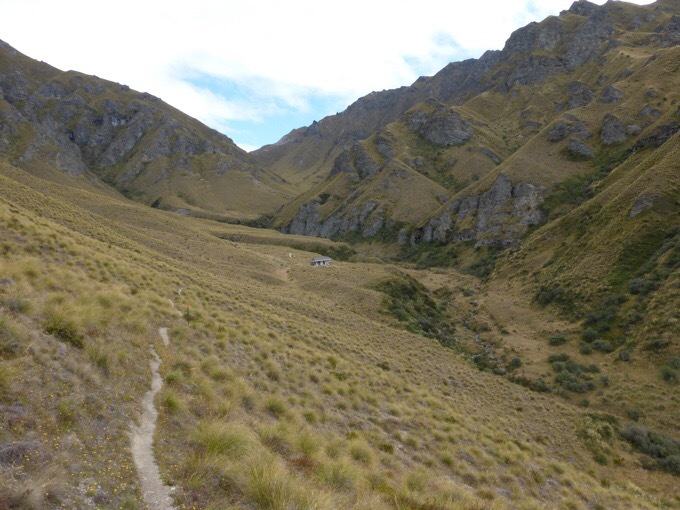 If either of you have occasion to pass through, you will have a place to stay, food to eat, and places to hike. Not sure if you go my earlier response, but I was able to edit your comment and remove the personal info meant for Griggs and me. It was great to meet you and Teri this morning and we may just show up again in SLO someday! Griggs sure looked happy in his new gear and suave! It is cool to see what small things make us happy, like having a new pair of functional shorts and a close shave. Really enjoyed the time-lapse. Very cool and worked for me on my Windows 7 machine. Watched it twice! I hope that Griggs will be with you when you finally meet up with Becky. I bet she’ll push you two a bit with her 21 years young hiker high! 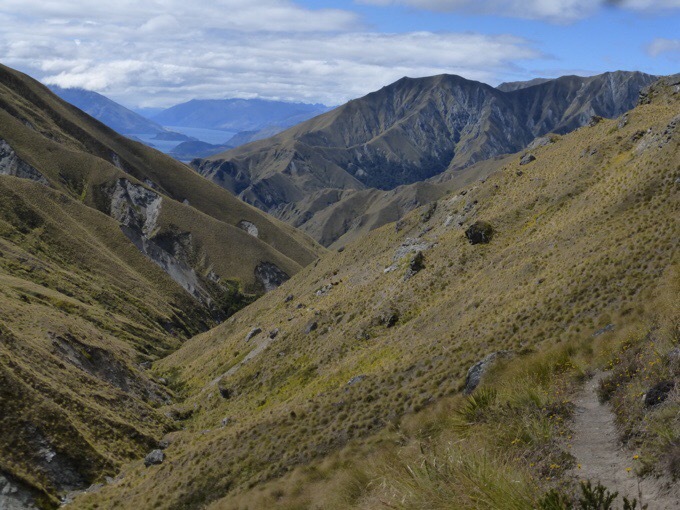 It is pretty amazing to see so many smiles out on a hard and beautiful trail. That the hard work brings out the smiles is so indicative of the love for trail and the outdoors. It is infectious. Great pants, Griggs, all will be well! Make sure no holes develop in the pockets so your marble remains secure.